Collecting old spark plugs is nothing new, although I've not really got in to this area much. I find odd spark plugs when I go looking for old-car related junk, and if they are complete and in good condition, I'll find a little corner for them. This one I found years ago, but I can't remember where. 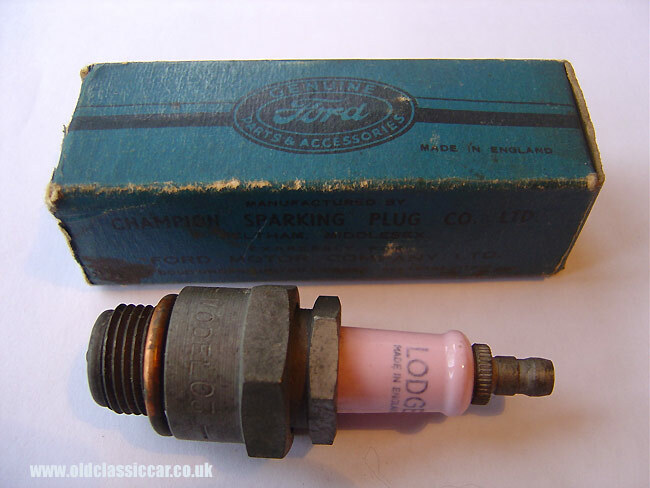 "Manufactured by Champion Sparking Plug Co. Ltd. of Feltham, Middlesex Expressly for Ford Motor Company Ltd. Sold under limited licence." On the opening tab, it tells the buyer that the plug inside is an 18mm 7.5" reach example. The pink Lodge plug within is unused, and has Model C3 stamped on it. This plug has never been used, and still came in its original tissue wrapper with the copper sealing washer in place. These early plugs, from the 1930s, were 'detachable' - by this they meant that the sparking plug could be taken apart for cleaning, unlike the sealed throwaway jobs that became popular after the war. 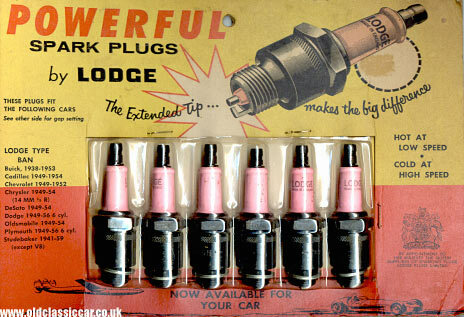 An old advertisement for Lodge Plugs can be found in the period advert section. A receipt from 1937, featuring illustrations of a Lodge C3 plug and tin, can be found here. Update. Bob in Canada sent me over the photo shown below, which shows an original set of Lodge sparkplugs in their original, and colourful, packaging. This set, type BAN, were designed to fit Buick 1938-1953, Cadillac 1949-1954, Chevrolet 1949-1952, Chrysler 1949-1954, DeSoto 1949-1954, Dodge 1949-1956 6 cylinder, Oldsmobile 1949-1954, Plymouth 1949-1956 6 cylinder, and Studebaker 1941-1959 (except V8 models). Despite advocating the advantages of the 'extended tip' Lodge plugs, those in the packaging did not feature this. The illustration on the packaging shows both an aeroplane (triple-tail Lockheed Constellation) and also a single seat racing car (Lodge was one of the sponsors of R.D. Poore when he raced his Alfa). Return to the Motoring Collectables section where there are many more items of motoring memorabilia featured, including a copy of Lodge News from 1956.